David Blunkett must end the detention of foreign terror suspects without trial "as a matter of urgency", a cross party group of peers and MPs has said. The emergency powers were introduced in 2001 after the 11 September attacks. Mr Blunkett is understood to be keen to bring in a new offence of "acts preparatory to terrorism" so suspects can be brought before courts. But the cross-party human rights committee said it was "not persuaded" by the idea. Thirteen foreign terror suspects are currently being held without trial at London's Belmarsh jail. The government had to "derogate" (opt-out) of the European Convention on Human Rights in order to pass the emergency detention measures. But to continue to do so in the long term risks "corroding the culture of respect for human rights," the committee warns. It proposes tougher rules covering both foreign and domestic terror suspects, as an alternative to indefinite detention. New "civil restriction orders" - such as curfews or tagging - to limit the activities of people thought to be linked to terrorism, but not themselves considered serious suspects. Lib Dem peer Lord Lester, who is a member of the committee, said: "We are saying that indefinite detention without trial is, in Winston Churchill's famous phrase, in the 'utmost degree odious' and that alternative means need to be found." The report also warns of the "disproportionate impact of the use of the Terrorism Act powers on the Muslim community". And it warns against the use of evidence in trials obtained by torture in other countries. The committee urges greater parliamentary examination of the terror threat. It says there should be some form of independent scrutiny to enable MPs to "reach a better informed assessment of whether the measures are strictly required by the exigencies of the situation". The home office said it "welcomed" the report and would consider its findings "carefully". 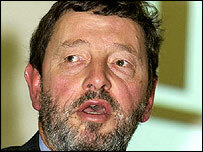 Mr Blunkett is expected in the autumn to renew powers set out in Anti-Terrorism Crime and Security Act 2001, which are due to expire in 2006. He is reported to be planning to merge the 2001 Act with the Terrorism Act 2000, which deals with domestic terrorism. The six month official consultation period for scrapping internment will close at the end of the month, with final decisions expected in November. Lib Dem peer and judge Lord Carlyle, who was appointed by Mr Blunkett to carry out the official review of the emergency terror legislation, said he felt the government was "ready to move on to the next stage". "It's contrary to our tradition to hold people without charge. There was an emergency after 9/11 but we are prepared now to replace the emergency legislation with something more enduring," he told BBC Radio 4's World at One. He said he favoured the creation of a new offence of "acts preparatory to terrorism," which would include such things as "providing bed and board" for suspected terrorists or credit card fraud to fund terrorism. The new law would apply to "everybody irrespective of nationality," he said. A spokesman for civil rights group Liberty said: "This report has taken a long, hard look at sensible ways in which one can combat the terrorist threat and decided that the current Government approach is almost certainly counter-productive. "The Americans have begun to realise that they cannot hold the Guantanamo detainees indefinitely. "Surely the British Government can also realise that they must release the detainees they hold, or put them on trial?" "The Home Office says they will consider the report carefully"